Look online now to see who will be participating this year! This is the path to be selected for the 2018 USA Hockey National Development Camps. Over the past few years, the CCM High Performance program has provided opportunities for players like Kacey Bellamy, Colleen Coyne, Meghan Duggan and AJ Mleczko. The female players below have been selected for the 2018 Massachusetts Hockey CCM High Performance Festival. They were evaluated over the course of the 2017-2018 hockey season and at the Girls Open Tryout on Sunday, March 25, 2018. The players listed below will receive an email from Massachusetts Hockey Player Development with a link to register for the Festival. The festival will take place Friday, April 20, 2018 to Sunday, April 22, 2018 at the New England Sports Center, 121 Donald Lynch Boulevard in Marlborough, MA 01752. Players selected should expect an email with more specific instructions. After being evaluated at the Festival, selected players will be invited to participate in the 2018 USA Hockey National Player Development Camp in June or July. Click here for the camp schedule. 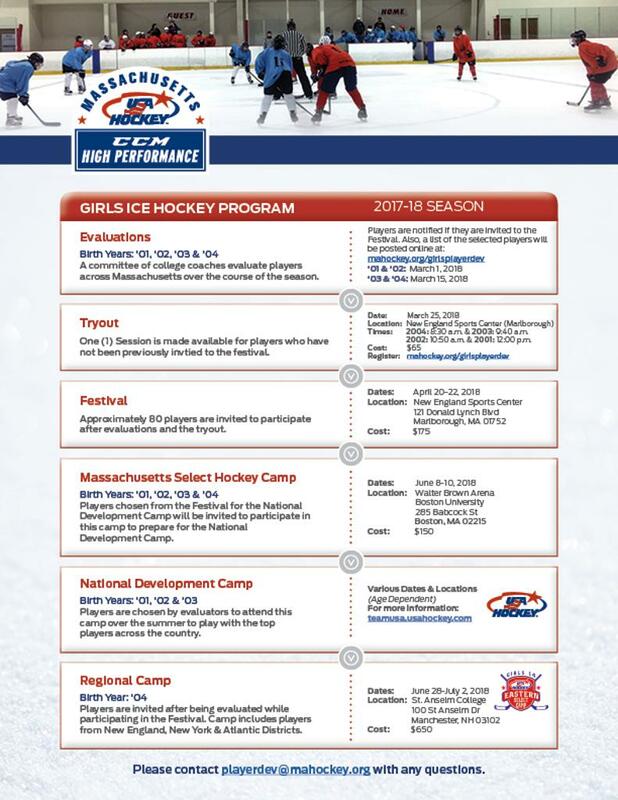 For more information about the program and its staff please refer to mahockey.org/girlsplayerdev. Players selected will also receive any email with more specific instructions. ALL Players selected for USA Hockey National Player Development Camp (2001 - 2003) & Eastern Regional Camp (2004) were invited to the 2018 Massachusetts Hockey Selects Camp June 8-10, 2018 at Boston University. This opportunity helped the young ladies prepare for the USA Hockey NPDC!